Internet-delivered cognitive behavior therapy (iCBT) may reduce barriers to treatment faced by people with obsessive–compulsive disorder (OCD). To date, most research on iCBT for OCD has evaluated clinician-guided treatments. However, self-guided treatments, which do not involve contact with a clinician, have considerable public health potential and may be particularly advantageous for those patients who report stigma as a principal barrier to treatment. 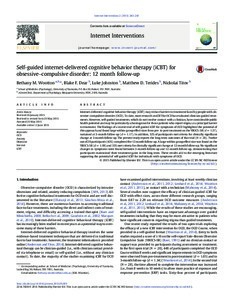 The findings of a recent trial of self-guided iCBT for symptoms of OCD highlighted the potential of this approach and found large within-group effect sizes from pre- to post-treatment on the YBOCS-SR (d = 1.37), sustained at 3-month follow-up (d = 1.17). In addition, 32% of participants met criteria for clinically significant change at 3-month follow-up. The present study reports the long-term outcomes of that trial (N = 28). Twelve out of 28 participants (43%) completed the 12 month follow-up. A large within-group effect size was found on the YBOCS-SR (d = 1.08) and 33% met criteria for clinically significant change at 12-month follow-up. No significant changes in symptoms were found between 3-month follow-up and 12-month follow-up, demonstrating that participants maintained their treatment gains in the long term. These results add to the emerging literature supporting the potential of self-guided iCBT for individuals with symptoms of OCD.